If I truly want to sit back, relax and just read a book for enjoyment's sake, Christian historical romance fits the bill. I discovered inspirational author Tracie Peterson a few years ago after picking up one of the books from her Ladies of Liberty series at my library. Peterson has written over 70 novels. 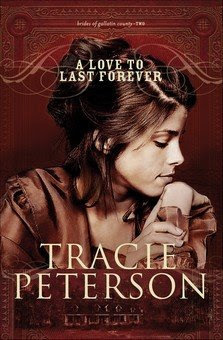 I just recently finished reading her latest titled, A Love to Last Forever, book #2 in Brides of Gallatin County series. Set in the 1870's, the Brides of Gallatin County series focuses on three sisters: Gwen, Beth, and Lacy. Together the sisters run Gallatin House, a roadhouse where they board and feed the stage coach passengers traveling through the Montana frontier. Book #2, A Love to Last Forever tells twenty-two year old Beth's story, focusing on her struggles with finding the right suitor and her fight to overcome a guilty conscience after her father's unfortunate death. Her supportive sisters and a strong faith in God help her through the hardships and uncertainties she faces. I immediately liked Beth's character. She's a book lover, particularly of dime romance novels and a hopeless romantic waiting for someone to sweep her off her feet. She also likes to scheme and her actions get her into trouble from time to time. Her main interests lie in the mysterious, hardworking Nick Lassiter and the suave Adrian Murphy, a railroad surveyor. Because her father made the family move so often during her childhood, the thing she wants most is to have a permanent home, someplace to set roots. Of all the sisters, I'm probably the most like Beth. Even though I read book #2 before book #1 of the series (Gwen's A Promise to Believe In), I didn't have much difficulty in understanding the plot. Peterson adequately fills in the main story lines so her books can be read out of order. Book #2 contains more drama, violence, suffering and losses than the previous book. I myself could have done without some of the violent scenes, though I suppose Peterson was trying to capture the spirit of the untamed west. I'm looking forward to finishing off the trilogy when book #3 A Dream to Call My Own releases in June. I have read most of her books-I just love them. Haven't seen this one-i will be putting it on my to-read list. Sounds really interesting! I really came by to say....I have an award for you! Please come by BOOKIN' WITH BINGO when you get a chance to pick it up. It is enchanting! Thanks! That sounds like a really good book. I'll have to see if my local library carries it.